An estimated $37 billion is completely lost due to unproductive meetings. Most employees dread meetings and often complain that they are too long and too frequent. With over 71% meetings described as unproductive, organizations still emphasize scheduling more meetings and employees mindlessly join in to contribute to an unproductive work culture. Elon Musk, the CEO of electric vehicle company Tesla, aerospace company SpaceX and tunneling venture The Boring Company, often has a lot of things to keep him busy all day. In a recent letter to Tesla employees, he pointed out some ruthless productivity tricks. In the past, organizations had no other option but to conduct large meetings that lasted for the entire day. But with the new age of virtual collaboration that combines a rapid pace and interconnected nature of modern work, the need to replace traditional unproductive meetings with a new set of collaboration tools has become evident. These tools are designed to help businesses evolve with the times and attain new levels of productivity and communication. Office Chat recognizes this need to enable companies with a unified communications service through the cloud that combines voice, video, messaging, instant messaging (IM) and presence, video conferencing, audio and web conferencing. This not only helps reduce setup and confusion but allows people to focus on high priority, high impact tasks. With the Office Chat latest version 2.12, users can conduct virtual meetings to help improve overall productivity. How many instances have you faced when crucial time was wasted attempting to fix IT issues and technical glitches right before your big online meeting. These glitches happen because most companies have multiple types of software for various kinds of communication. They use separate email clients, video conferencing tools, landlines and mobile phones, office communicators, separate instant messaging apps on a smartphone, etc. These multiple apps have their own learning curve and technical complexities. Any normal employee has to first master all these complex types of software before they can actually be productive. Hence, during any online meeting, it always requires an IT support personnel to assist normal employees for simply starting and getting over these technical glitches. And if you are scheduling an important online meeting, isn’t it logical to invest in software that is dependable and easy-to-use to streamline your next virtual meeting from start to finish? Office Chat helps you to replace all unproductive communication mediums such as emails, stale office communicators, consumer-grade mobile apps with just one easy-to-use instant messaging application. Office Chat now has features with that offer the best screen sharing, video and voice call features. As a cloud-based service with a simple UI, Office Chat eliminates most of the technical queries associated with regular conferencing apps, eliminating the need to have the IT team on standby. 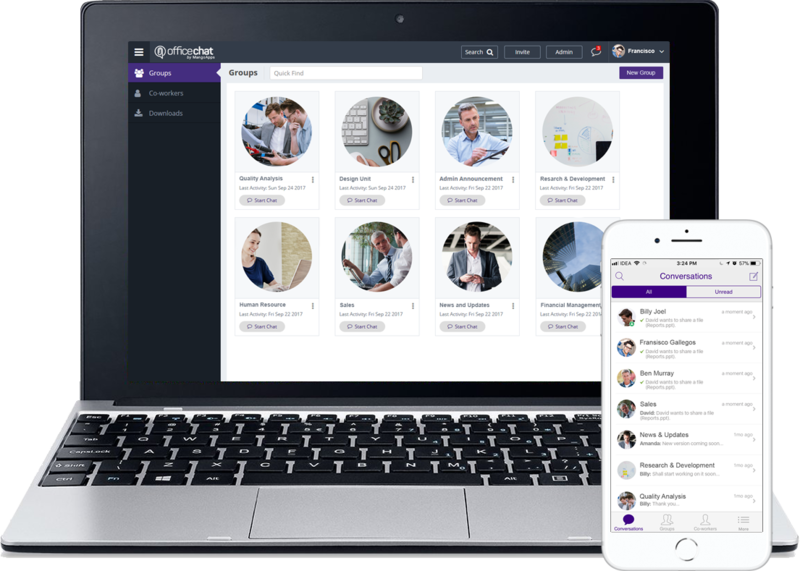 Office Chat is available on multiple platforms such as web browsers, desktop and smartphone improving the reach of your employees. 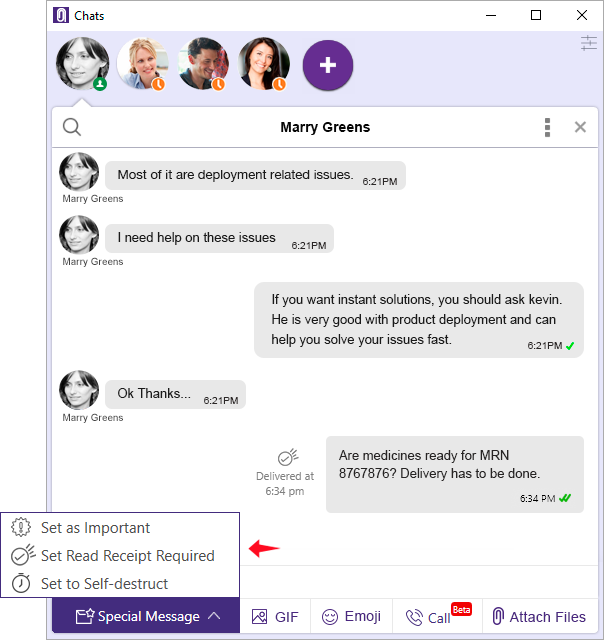 It requires no special sessions to train your employees on using Office Chat features including screen sharing and video calling. Amazon CEO Jeff Bezos instituted the famous two pizza rule to improve the productivity of his meetings and that has immensely helped the company to focus on efficiency and scalability. The principle is simple, the more people you pack into the meeting, the less productive the meeting will likely be. This principle becomes much more important and must be effectively modified when you consider virtual meetings, as the aim for them is higher productivity as compared to traditional meetings. Small relevant groups of people involved in an online meeting results in quicker and more efficient decisions. Regular productivity killers associated with traditional meetings such as social loafing and groupthink are completely avoided. Office Chat allows 1-to-1 voice, video and screen sharing in your private chats. It comes with the added ability to share the URL with a 3rd co-worker to join the call. 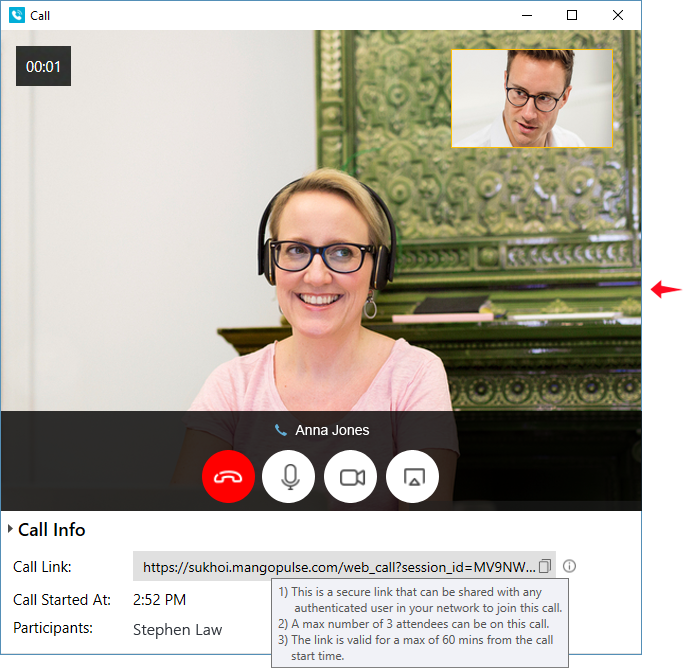 With an emphasis on having small groups with relevant people, Office Chat enables you to start a 1-to-1 voice, video and screen sharing call from the Windows/ Mac desktop apps and web browsers. You can also join an existing 1-to-1 voice, video and screen sharing call from both iOS and Android Office Chat Apps. Traditional meetings are often scheduled for 30 minutes, 60 minutes or even more. A lot of time is wasted when people arrive late and often the agenda gets shifted to something trivial. This, along with many other factors, extends meetings and make them ineffective. The best way possible to avoid these is to conduct shorter meetings. With Office Chat video calling and screen sharing, you can implement Nicole Steinbok’s 22 – minute meetings in your own organization without the hassles of a traditional meeting. Such meetings work amazingly well to keep every participant conscious of both start and end times. You will be astonished to realize that you can get the same amount of work done in a 22-minute meeting as in any 30-minute meeting. During most meetings, rampant multitasking, such as checking smartphones, searching for meeting related material, etc. often leads to unproductivity. Avoiding such distractions will help expedite decision-making, attentiveness and the meeting’s resolution. Teams will be more ‘present’ and will enable more effective outcomes. Office Chat offers an all-in solution to improve productivity within your organization including meetings. Office Chat comes with a highly advanced file sharing feature. Office Chat not only gives you the option to send text messages, but you can also share documents, videos and more. In addition, you can upload meeting relevant files, images and video (any size up to 2 GB) to be shared with the participants. With Office Chat, you can simply drag and drop attachments and files. With over 100 GB of file storage and features to search chat history and even file contents, you can easily share relevant meeting-related files and attachments with your colleagues and managers. Office Chat also emphasizes noise-free communication so that all the participants can mute all work-related communication to help them focus on the meeting. You can easily replace multiple distracting communication mediums with a simple and easy-to-use Office Chat. Check this to learn more about how you can replace emails using Office Chat. Researchers at Microsoft Canada surveyed 2,000 participants and studied the brain activity of 112 others using electroencephalograms (EEGs). They found that since the year 2000 (about when the mobile revolution began) the average attention span dropped from 12 to 8 seconds. Often with traditional meetings, when one participant starts his presentation the attention span of the audience drifts. Participants often get distracted with pop-up notifications and e-mail. Meetings should enhance productivity, inspire creativity and enable teams to work effectively — not the opposite. With an application such as Office Chat, you can make more meetings much more productive as it focuses on participation from all members. Participants can present as well as engage with the audience so as to get their feedback. This will also ensure that all participants are on the same wavelength during the conversation. Distractions from multiple applications get reduced when you use a noise-free communication application such as Office Chat. The minutes of a meeting are the most important for charting the further course of action. Often after the meeting, it requires that these minutes are sent via email to the participants. There is no way to know if they have received and read the message. The effectiveness of recently concluded meetings depends on if the minutes have been received and read by the stakeholders. With Office Chat, when you have concluded the meeting you can send the minutes of the meeting to the stakeholders for review. These can be sent in the form of a file, document, text, etc. via Office Chat private and group chats. You can also use the read receipt feature which ensures that the recipient has read the important message and enables the sender to know when the message has been read by each recipient. Office Chat is available on multiple platforms including on Android and iPhone. This smartphone app helps users to keep themselves informed with the latest updates via notification in real time. Sharing files, audio, video and GIFs, contributing within a team as well as one-on-one chats all work seamlessly.